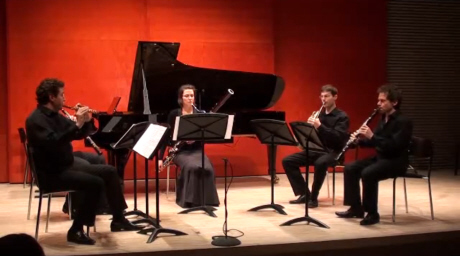 This suite began as a miniature "concerto" for the Schubert Octet combination. It was written for a workshop with The London Mozart Players in Spring 2003. I was inspired by everyday break-time views of children at play at school where I taught, and also by the Breugel "catalogue' picture" on the same subject. This Beethovenian scherzo is full of sudden shifts (of dynamics and metre) such that, with the exception of a brief respite in the central section, it is difficult to establish "ground level stability" for more than a moment. The piece perhaps owes most to my former manner of writing in its jokiness. I subsequently made an orchestral arrangement. 2008: Further movements were (finally) added - always it was my intention to expand the original piece into my own Jeux d'Enfants, or Mladi. This suite is scored for wind quintet only. Their catalyst was a visit to the magical world of Robert Coudray ("Poet Welder" of Brittany), who refuses to abandon his sense of childhood wonder; he "re-invents the invented" which challenges our comfortable adult sophistications..... These thoughts resonated nicely with my earlier conception!